Legend tells us that Delphi was the point where two eagles, which had been released by Zeus at different ends of the world, had met again after their flights across the skies. 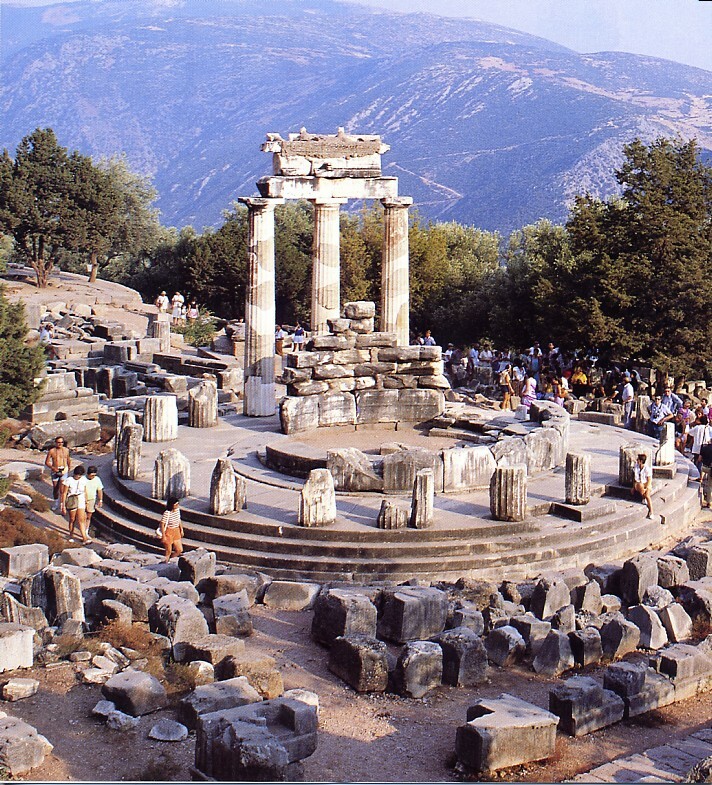 Zeus threw the Sacred Stone at this exact point, and Delphi became known as the centre of the world. 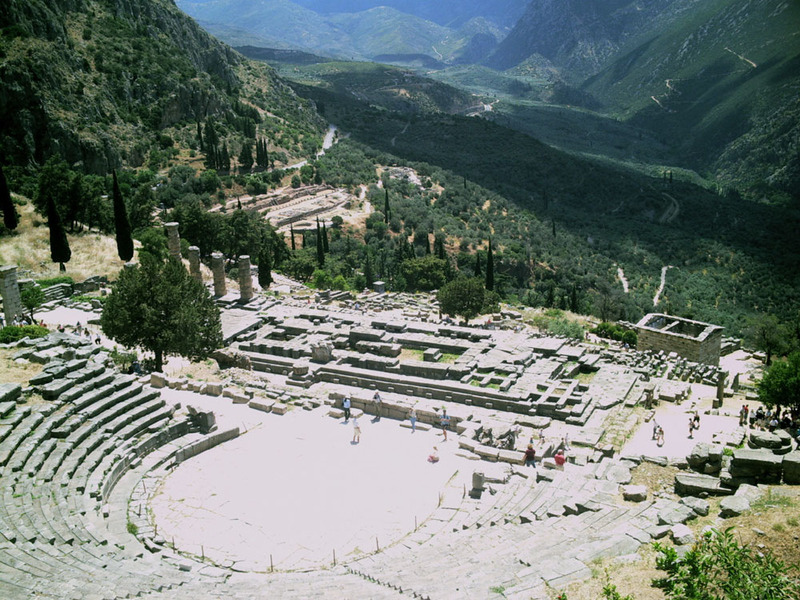 Legend states that originally, the site that would later become known as Delphi, was a sacred place which was inhabited by the Earth Goddess “Gea”, and which was guarded by her child, the serpent Python. Apollo, son of Zeus, left from the top of Mount Olympus to slay Python and therefore make this area his own shrine. Apollo was believed to be the god of reason, associated with many forms of rational such as music, law and prophecy. His slaying of Python was seen as a triumph in the eyes of the Greeks who believed it to signify a victory over primitivism. After the slaying of Python, Apollo left Delphi in self-imposed exile, as both punishment, and to purify himself before returning. 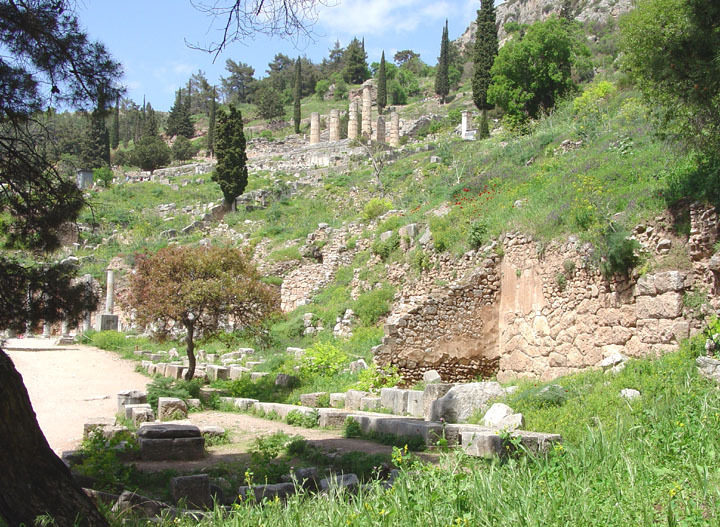 The area was named Delphi, after Delphis (meaning dolphin in Greek). This was the form that Apollo took when he brought back a Cretan ship, with the intention of the Cretan sailors to build his shrine and also in hope that they become priests in his new temple. 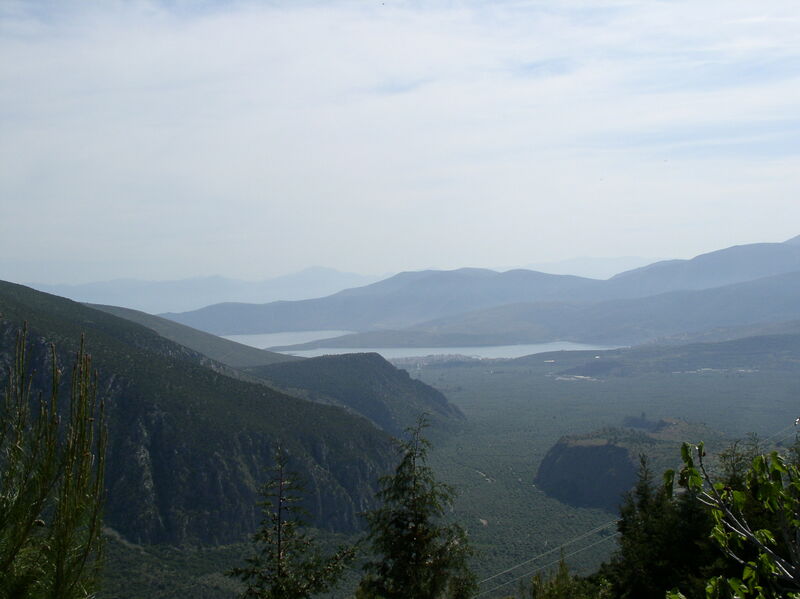 On his return to Delphi, Apollo was crowned and took over the oracle, which from this point onwards, belonged to him. At the exact point were Apollo had sley Python, an Omphalos stone was placed into the ground. The Omphalos stone, which in ancient Greek means the “centre of the earth”, would later be the location of the main sanctum for the shrine of the Delphi Oracle.needs to be explored to be fully appreciated. 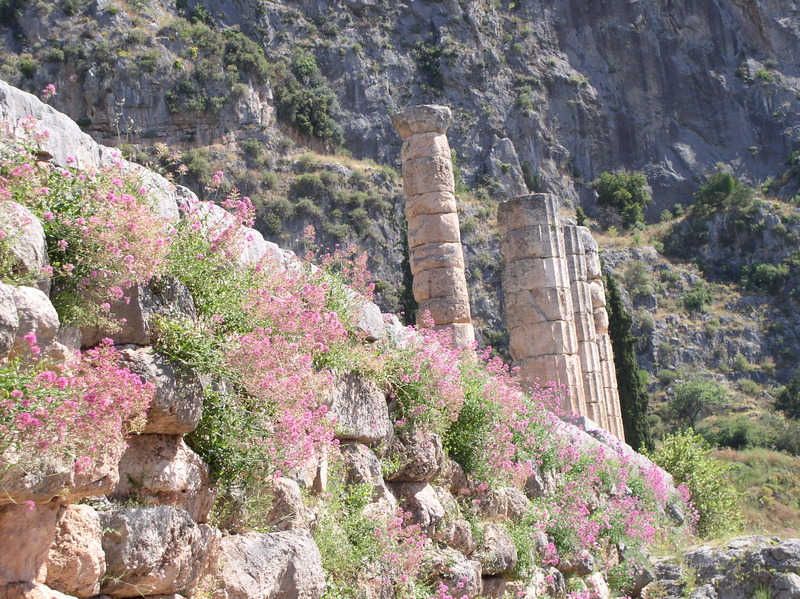 During the 7th century BC, Delphi became very important, due to it being the main centre of the Amphictionic League. Originally, Delphi was under the tight control of Krisa, but in 585 BC it was liberated by Kleisthenes, a tyrant from Sikyon. It was after this liberation that the real history and fame of Delphi began. Kleisthenes built new structures including the treasury, and was also responsible for the introduction of the Pythian Games, similar to the Olympic Games in that they would take place every four years. During the Pythian Games, there were performances in the theatre, and at the stadium, about 7000 spectators would watch athletes racing around that track. 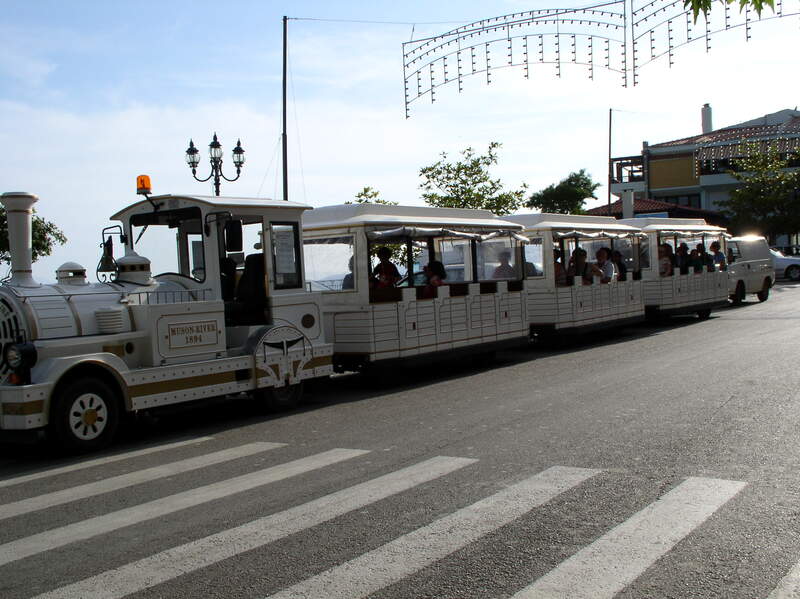 There would also be chariot races in the stadium. 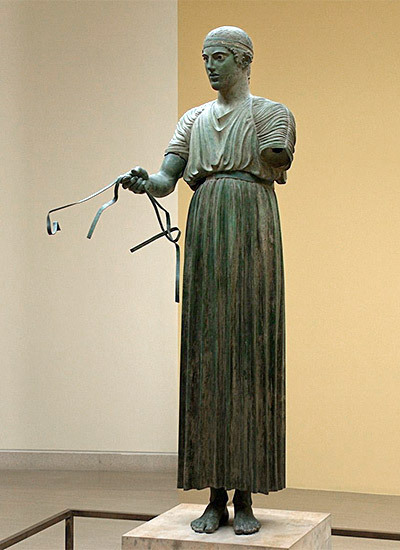 Delphi was the most important shrine in Greece during the Archaic period, (750-550 BC), and every Greek city which planned to start a colony overseas would first consult the advice of the Oracle before doing so. When these colonisations were successful, offerings from the people of the towns were sent to Delphi as thank you gesture. This process led to Delphi growing in great stature and wealth. The Sacred Way, which passed the Temple of Apollo and through the sanctuary was lined with over 20 treasuries, which housed gold, silver and priceless arts of work. These treasuries were beautifully constructed marble buildings. All of the most powerful city-states in Greece built their treasuries in Delphi, and those, which could not afford to do so, erected statues along the Sacred Way. All of the city-states in Greece contributed funds to the Temple of Apollo. A massive Doric temple was constructed by the Archaic period and stood on one of the very few spots in the sanctuary that was level. Above the temple door were carved such admonitions such as “Know Thyself”. This was where all those wishing to consult the Oracle would come. The Oracle of Delphi was a spiritual experience, in which advice and questions were asked to the spirit of Apollo. The reply from Apollo would be channelled through priestesses, known as Pythia, who would be seated on a tripod over a mysterious chasm that expelled mystic vapours, said to enhance the channelling of Apollo. There was a routine that had to be followed by the Pythia before they could start channelling messages to and from Apollo. First of all, they would bathe in the nearby Castlian Spring, said to have sacred waters. They would then drink from the sacred Kassotis Spring. After this, they would sit near the Omphalos Stone, and would enter into a trance-like state. The description from legends about the mystic fumes that would be expelled from this mysterious chasm were much debated and were believed to be merely a fabrication from Delphi times, as though to make the stories seem, if you like, as some sort of fairy-tale. In 1892, French archaeologists began digging down to the foundations of the temple, but where unable to find any evidence regarding the crevice from where these fumes could be released. This evidence is what led many to believe that the legends about these fumes were incorrect. It was because of the answers to questions and foresights being so accurate that the Oracle would become a hugely important and highly influential part of Greek life. 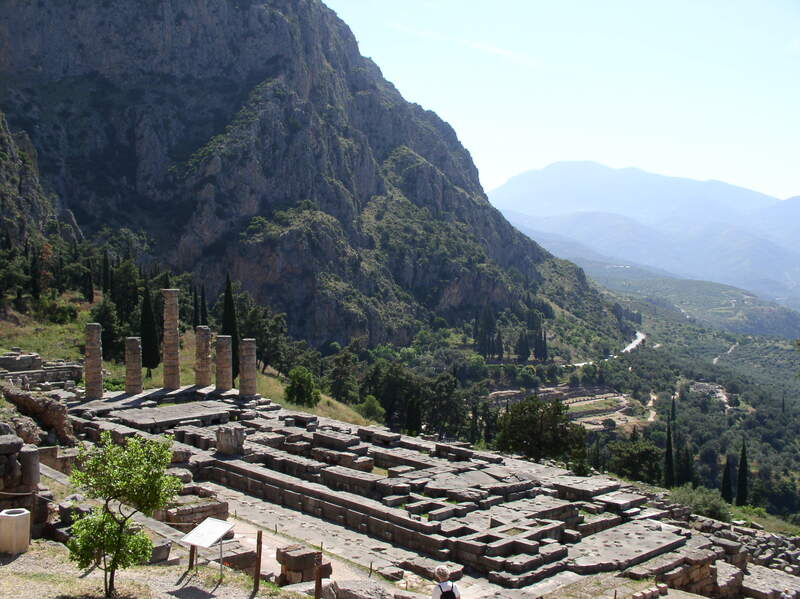 After Philip of Macedonia controlled the shrine of Delphi, as well as most of Greece, visitors would still make the trip to Delphi, but not in the numbers that had been seen previously. Even the Romans would at one point have control Delphi, but sadly, all of these Sacred Wars and the constant battling of who would gain control lead to the ultimate demise of the importance of the Oracle and Delphi. Despite several attempts at reviving the Oracle, nothing could be stop its decline, and it soon lost its right to be known as the centre of the world. The last recorded Oracle, which was in 362 AD, was a message to the Pagan Emperor, Julian the Spostate, which said “Go tell the King, the well-wrought hall has fallen in the dust; Phoebus Apollo no longer has a home or laurel, or a murmuring spring. Even the talkative spring has dried up and is no more”. After such brutal and long fought battles for control over it, along with the arrival of Christianity, the importance of Delphi and the Oracle slipped silently into obscurity.